Uncomfortably hot temperatures in the Hex River Valley on Wednesday seemed to match a generally fractious mood. Cosatu’s claim on Tuesday that they had reached a deal in Clanwilliam that could be rolled out to other farming communities now seems shaky without the buy-in of Agri SA – or indeed all Clanwilliam farmers. And despite Cosatu’s announcement that they have suspended the strike for a week, De Doorns workers are having none of it. By REBECCA DAVIS. Some De Doorns farmworkers have a special name for the current minimum wage of R69. They call it a “hunger loan”, a reference to how pitifully inadequate they find the amount. But last week’s optimism about their chances of securing their R150 raise now seems to be dissipating, despite their stated resolution to stand their ground. While Scheepers – who rejected the term “community leader”, but seems to occupy a central and well-liked position – took the Daily Maverick around the Stofland informal settlement on Wednesday, a number of workers voiced concerns to him about their increasing isolation in the labour dispute. But exactly who they were waiting to hear from seemed unclear. When Scheepers expressed his scorn at Clanwilliam, he was referring to the so-called “Clanwilliam Deal”, trumpeted by Cosatu on Tuesday as a possible solution to the winelands labour dispute: a wage raise of R105 per day for farmworkers, with guaranteed immunity for strikers returning to work. No sooner had Tony Ehrenreich announced the breakthrough, though, than it became apparent that this might be something of a false dawn. The agreement, which was portrayed as covering all Clanwilliam farmers, was actually a deal struck between Cosatu and a single farmer, Cape Orchids director Gerhard de Kock, who reportedly made the commitment on behalf of just 12 farms affiliated with the Cape Orchards company. Not in our name, Agri SA was quick to state. “This particular offer was not supported nor mandated as a collective agreement by other farm leaders and representative organisations of commercial farmers from Clanwilliam,” read a statement put out by Agri SA. The Clanwilliam Deal, they said, was simply an example of an individual farmer negotiating with his own workers, which Agri SA has “consistently” argued in favour of. But such a deal certainly could not be regarded as binding on the rest of the sector. Then the individual farmer himself – Gerhard de Kock – also voiced concerns about the deal. BDLive reported that De Kock had not actually signed any agreement on the matter, but “had made a commitment to implement the new wage from the first quarter of this year”. In response, he had been assured by Cosatu that farmworkers would return to work on Wednesday – but they hadn’t. “Cosatu are not playing ball. Workers in the Hex River Valley, in particular, have not returned to work, despite Cosatu’s promises,” De Kock said. In De Doorns, workers made it quite clear that they would not be dictated to by Cosatu. At labour hearings held on Wednesday evening in De Doorns, workers reportedly said that they would not settle for less than R150 per day, and would not heed calls to halt the strike. It’s doubtful how long they can hold out for, though, if the rest of the region’s labour force is willing to follow Cosatu’s directive. If there is one issue that the Stofland community can rally around to sustain their resolution, however, it may be the death of 25-year-old Letsekang Tokhwane, allegedly at the hands of the police. Some media outlets have reported Tokhwane’s death as the result of his being “caught in the crossfire”, but eyewitness accounts suggest what may have been a disturbingly targeted attack. Tokhwane’s boss, a spaza shop owner known as “Boetie”, gave the Daily Maverick an account of Tokhwane’s attack through an interpreter which tallied closely with that given to ENCA on Tuesday by another eyewitness. Both claimed that Tokhwane was shot and beaten by police while in the spaza shop in which he worked, and that Tokhwane had then been chased by police to the site of an unfinished RDP house. 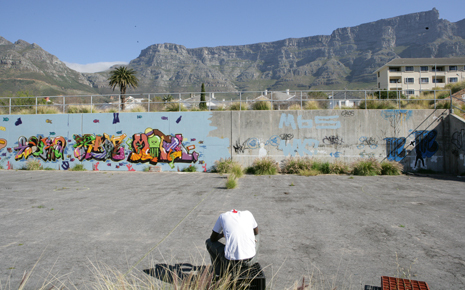 The Daily Maverick visited this site, which was perhaps 250 metres from the shop. Blood was visible on the path leading into the house, as well as on the ground of the house’s interior. In a corner lay a cap, which Scheepers claimed belonged to Tokhwane. There was no evidence that the site was being treated as any form of crime scene investigation yet, despite the fact that the matter has been referred to the Independent Police Investigative Directorate. If the eyewitness testimony is accurate, there is clearly a question to be answered by police as to why it was felt necessary to pursue Tokhwane a relatively far distance. It is a particularly mysterious issue given that Tokhwane, as has been widely reported, was not a striking farmworker. Boetie, and another man present in the spaza shop, also claimed that the armoured vehicle into which police allegedly bundled Tokhwane did not have a registration plate. “[Tokhwane] didn’t toyi-toyi,” said his boss, Boetie, through an interpreter. “He just worked in the shop. He was a good man. I worked with him for a long time.” Boetie said they want the police to pay for Tokhwane’s body to be taken back to Lesotho, and to pay for his funeral. There are other unanswered questions about police conduct in De Doorns. The Daily Maverick met a ten-year-old girl who had been shot in the eye, allegedly while sitting outside her family’s shack. There have been other alleged incidents of this kind which suggest, at best, indiscriminate shooting. We also visited the home of Rapelang Moteoli, who had been shot in the stomach last Thursday. He subsequently spent four days in Worcester Hospital. Moteoli now wears a large bandage and was clearly in physical discomfort. Moteoli’s shooting is also disturbing because it allegedly took place at 3am, when he claims he was peacefully in bed. His home is set fairly deep within the Stofland settlement, down a narrow makeshift alleyway. There is some evidence to suggest that the shooting did indeed take place in Moteoli’s home, because the door next to his, separated by only a metre or two, bore signs of having been shot at and kicked. Stofland local Monwabisi Kondile claimed to the Daily Maverick that police shot and kicked at this neighbouring door, discovered a woman inside, and then moved directly next door to shoot Moteoli. A delegation from the Human Rights Commission visited De Doorns on Wednesday. The body says it will be following up allegations including the notion that police are colluding with farmers (a common perception in Stofland), and that police have used excessive force on workers. 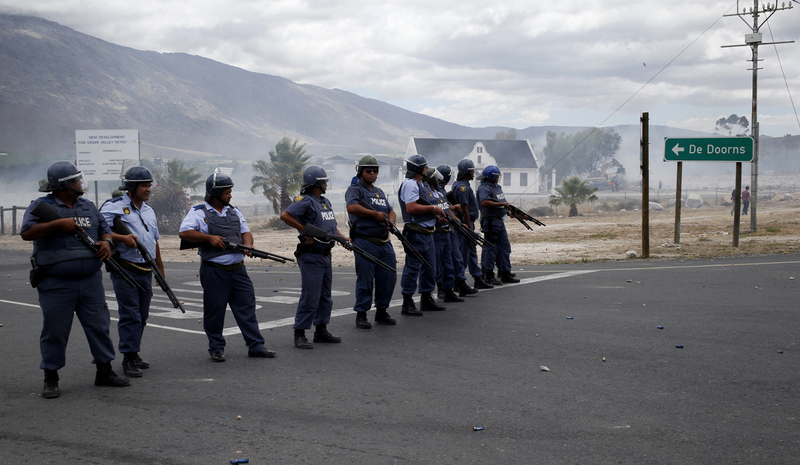 Frustration with police actions in Stofland may provide one reason why the De Doorns workers seem more resolute than the rest of the region in holding out for their demands. Another potential reason is the influence of Bawusa general secretary Nosey Pieterse, who has repeatedly urged De Doorns workers not to back down, even as former fellow strike-leaders like ANC Boland chairperson Pat Marran have distanced themselves from the strike in the face of violence. Even if Cosatu’s call for a week’s halt on the strike succeeds, it’s unclear what will have changed by 23rd January, Cosatu’s deadline. The trade union body has told Agri-SA that they need to see a “positive reply” with regards to negotiations from the agricultural body by then or the strike will resume. Unless Agri-SA drastically shifts tack over the coming week, this seems unlikely. Cosatu also applauded the Department of Labour’s ongoing public hearings into the sectoral minimum wage issue, saying they represented “a great victory for workers”.